BMW cancels CS coupe | What Car? BMW has cancelled plans to build its CS four-door coupe. The decision is seen as the company reacting to the global downturn in vehicle sales. 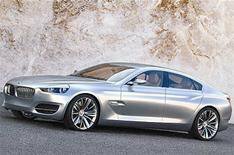 The CS had already been previewed as a close-to-production concept car and would have sat with the 7 Series. BMWs profits are down 62% compared with 2007 and the firm has already confirmed that it has cancelled development work on the X7 SUV. The German company now plans to focus on Project I, its programme to produce a small city car. Production is scheduled for 2010 or 2011.